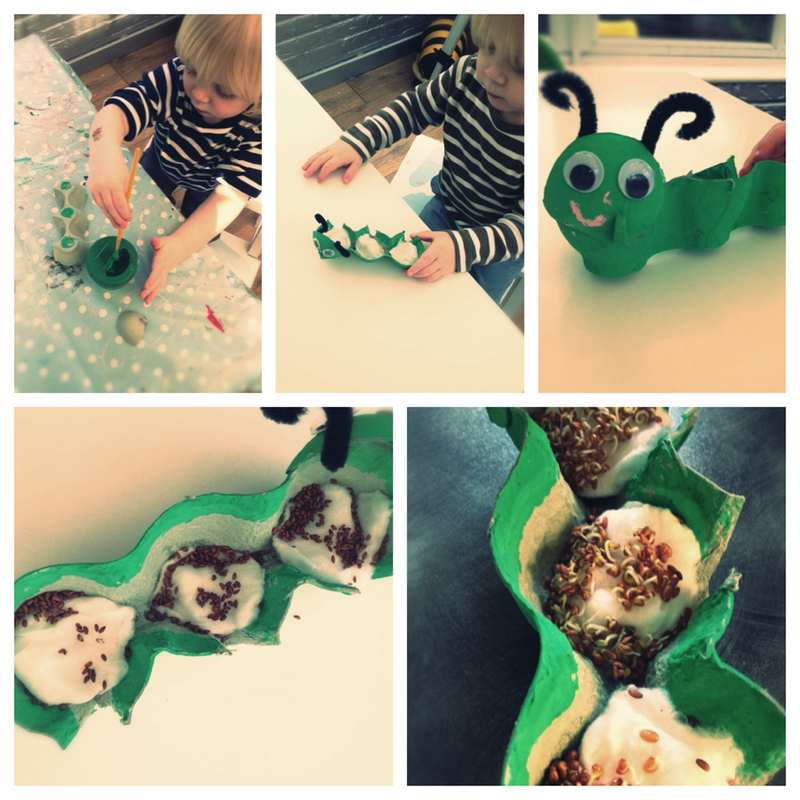 Cress Caterpillars are a fab introduction to gardening for young children. Kids have a natural interest in gardening and growing plants. They love the whole process, planting, watering their little project and looking after it and in the case of cress caterpillars eating it once it’s grown. 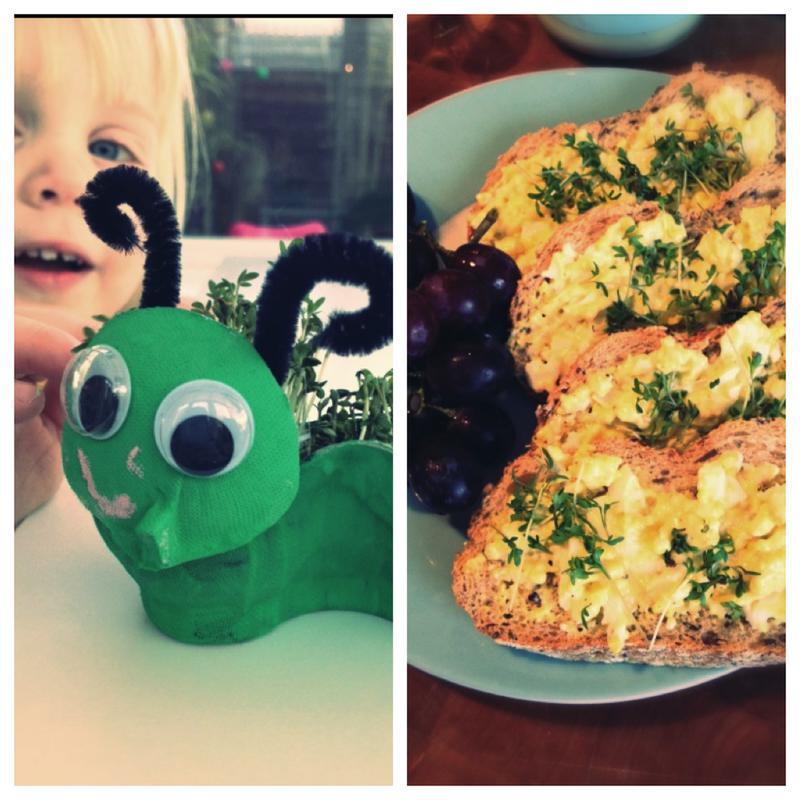 Cress Caterpillars are a really lovely activity for younger children – nice and bright and fun. These are fun to make leading up to spring. You can grow them inside on a nice sunny windowsill. The huge advantage of growing cress is that you really only have a few days to wait until you can eat it. Firstly cut the egg box in half so that we have 3 mini plant pots in a row. Next we cut a caterpillar face from the egg box lid. Paint the whole caterpillar and face green and then allow to dry. Using sticky tape attach the caterpillar face to the body. Stick on curled pipe cleaners for antennae. Stick on the eyes and draw a smile. Fill the plant pots with cotton wool. Sprinkle cress seeds into each pot and dampen with a sprinkling of water. Put onto a nice sunny windowsill and water every day. After around a week of growing the cress will be ready to eat! So – put your egg on to boil – just pop it in a pan, cover with cold water, bring to the boil and boil for around 7-8 minutes. Then remove the egg and allow it to cool. Once cool, peel off the egg shell and chop with a teaspoon of mayonnaise. Spread the chopped egg mayonnaise onto slices of bread. Help your child to snip the cress with scissors and give it a quick rinse. Sprinkle on top of the egg mayonnaise sandwiches. Lots of learning opportunities incorporated into this activity – plenty of language and conversation practice, use of descriptive words. Fine motor skills involved in the making of the cress caterpillar. The simple science of growing plants, watching the seeds germinate and start to grow. And ending with helping to cook a nice little lunch. We like to read the Hungry Caterpillar as our bedtime story whilst we are doing this activity! For more great gardening activities check out the RHS Family Website. Plant it, grow it, eat it – great things to do with kids UK. « Create your own Jurassic Era & start the ice age!